Has God ever asked you to do something that made no sense? That was Jeremiah's situation on this day. If we look at the context of our reading, we see the incident that sparked his this-makes-no-sense prayer. God had asked him to buy back the family farm in the village of Anathoth (Jeremiah 32:7) though he was a prisoner in a city surrounded by the Babylonians (Jeremiah 32:2). It was a symbolic gesture—a sort of down payment on the future. It was his act of obedience and faith in God's words, "Houses and fields and vineyards shall be possessed again in the land" - Jeremiah 32:15. Jeremiah did what God told him to do, but he didn't understand. In his prayer, he unburdened himself to God. He starts out with praise - Jeremiah 32:17-19. He recounts how God has been faithful in keeping His promises to Israel - Jeremiah 32:20-22. Israel has been unfaithful at every turn and, to Jeremiah's mind, deserves the fate that seems imminent - Jeremiah 32:23-24. He ends - 'And you're asking me to buy land in this place, when the city is on the brink of falling to a foreign power?!' - my paraphrase of verse 25. Perhaps God has asked us to do something similar—to step out in action, by faith, even though the surrounding events don't support the outcome we hope for. Jeremiah's obedience in buying that field is a great example to us. His prayer is an encouragement, at least to me. 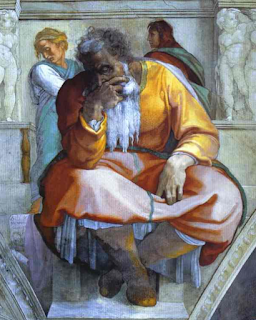 It shows that even Old Testament spiritual giants had questions and the nerve to query God on what He was up to. Here Jeremiah was frank in his feelings. His faith needed stretching, just as ours does. "Behold I am the Lord, the God of all flesh. Is there anything too hard for Me?" - Jeremiah 23:27. PRAYER: Dear God, help me to be as quick to obey You as Jeremiah was, even when what You ask doesn't make sense to me. Thank You for the humanity of Jeremiah that comes through in this prayer. Help me to be just as transparent with You when I pray. Amen. "First, we are permitted to pray all the dimensions of an unresolved life and an unsettled faith .... the God to whom we pray is hidden, mysterious, grand, and majestic, beyond all our patterns and systems of understanding. We celebrate a God of generous fidelity but this is a God who will not be mocked. We know about a God who calls to account, but beyond accounting there is the God of immense forbearance; therefore we must voice all those traces of God's holiness without managing them too closely" - Walter Brueggemann, Great Prayers of the Old Testament, pp. 73, 74 Kindle edition (emphasis added).